Why do ninjas usually replace their own body with a block of wood? Take as an example the Body Replacement Technique from the Naruto series. Using this technique, any user can replace his own body with some other object, but most of the time ninjas replace their body with a block of wood. This has also been seen in the Naruto series when Kakashi takes the exam of Naruto's team. So the thing which really bothers me is that they replace themselves with a block of wood, and not something else. I have even seen this type of event happen in other anime. It is quite common for ninjas to replace themselves with a block of wood. In-universe, no reason is given apart from the fact that every time I can recall this happening they were near trees and thus a chunk of wood was convenient. The actual source is never addressed, and we never see trees falling over because they lost a chunk of themselves. For the real-world reason...It's a Japanese trope based on the actual legends built up around historical Ninjas (probably also by said Ninjas, for whom misinformation was a great tactic). "Kawarimi" was a supposed technique possessed by the ancient Ninja that used misdirection and split-second timing to swap places with something that could easily be mistaken for the Ninja. There may be some historical grounds for this, but not to the extent we see in Naruto. Instead, this could easily be a trick used by historical ninja to trick and mislead enemies, and build up the mythos they had constructed for themselves. As an example, a Ninja may have previously prepared a wooden dummy that was about his size and dressed it in the same clothing as he was wearing. This dummy could be hidden somewhere convenient for later use. Then, when fleeing pursuers, you head back to where you hid the dummy and in a moment where your pursuers lose track of you (either with natural obstacles or a smoke/flash explosive set off), you set the dummy in your place and go the other direction. You could even set it up to go over a cliff. While your pursuers are distracted by the dummy, you slip away. Thus was built up the legend that Ninjas could 'trade places' with things, and since wooden (or straw) dummies were convenient for those purposes, they likely got used the most. Over time, this morphed in Japanese culture along with a lot of the other myths of the Ninja. For example, the myth of Ninja dressing in all black growing out of Kabuki Theater (Stage hands dressed in all black, and so theater goers were used to completely ignoring them...so when one of them jumped out and drew a sword, it was as if they had appeared from nowhere...allowing the theater to have 'super-stealthy Ninjas'). Over this time, the idea of the Kawarimi morphed and changed until it landed on them simply swapping places with a log. Even the particular appearance of the log is somewhat standardized in this trope: a short round chunk of wood of about the same thickness, either completely smooth or with a single 'stump' branch coming off the side. It turns up in quite a number of places, from other anime and manga to a bunch of video games. In short, in Japanese culture, the "kawarimi log" is simply the standard thing for a Ninja to swap places with, without regard for where it came from. It's the same idea as how, in American culture, if something is blindly tossed out a window, there will be a cat down there that yowls and knocks over a bunch of stuff over...or how no one questions that saying "Well, at least it can't get any worse" will instantly make things worse...or how someone can put on a pair of glasses, and that is considered a solid disguise. So, while there is no in-universe explanation...the out of universe explanation is simply "it's a standard narrative tool in Japanese culture." In older ninja movies this substitution is not limited to a block of wood, with straw dummies, nearby vases or chairs or other objects substituted in the place of the infamous ninja log. The use of logs has simply become a cultural norm much the way that any TV trope gets reused over and over; just like how everyone who gets fired on TV has a convenient file box of items to carry out as they leave, or every ghost is visible in a nearby mirror but the character cannot see them, or my personal favourite, every abandoned car has the keys stashed up in the visor for the protagonists to find. Obviously they can't replace a body with another body. That won't be ethical at all with ninjas also as humans. Most importantly the wooden log they use to replace is almost proportionate to the size of ninja using that body, it is hard to soak up any effect of kunai and also stop it's movement. 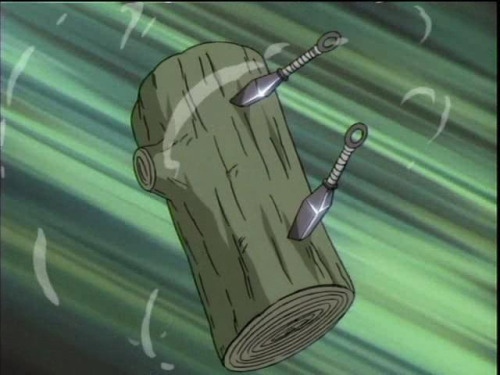 And those logs are easily forgettable and generic to emphasise more of the fact that the ninja has used "body replacement jutsu" to successfully dodge the attack on himself. So there is a very little chance for the viewers to ask "why only wood" except for your case here. Now there will be more controversy if instead of wood, ninjas use human dummies or stone because most of ninja fight scenes settings have trees around. No dummy laying around. Also the rock of size proportional to ninja himself will use more of chakra and rock might harm a lot more than wood in case jutsu goes wrong. It is a trope of old ninja movies to substitute oneself when aware of an immenent attack. As for in universe explanation, the main cast all live in the Village Hidden in Leaves, the first Hokage grew the huge forest surrounding the village, an abundance of wood allows for ninjas to substitute their body for a block of wood, allowing them to avoid the attack and manuevuer behind the enemy to strike back. Gaara is seen using a sand decoy in Shippuden to replicate this technique as obviously not a lot of trees in the Village Hidden in the Sand. Not the answer you're looking for? Browse other questions tagged naruto tropes or ask your own question. Why do ninjas run with their hands at the back? How did Naruto land the finishing Rasengan on Pain? How does the Sword of The Thunder God get stopped by a Kunai? Is “Talk no Jutsu” actually a thing? At what age did Kakashi Hatake become a Jounin?